the president announced on Thursday night. on our thoughts about immigration reform. also connected to thoughts on reform. and the executive orders he issues about reform in our lives. Solemnity of Our Lord Jesus Christ, King of the Universe. King of the Universe: you just can’t get more executive than that! and that’s how we honor Christ today. above and beyond my own personal authority? for reforming my life and my ways? he’s calling me to make? to whom do I pledge my allegiance? to whom do I bend my heart? to whom do I subject my will? my integrity? my honesty? my purity? my generosity? my charity? my humility? my loyalty? my morality? my sincerity? my piety? but the harder question is this: is Jesus the King of my heart? Does he rule over the choices I make? Does he govern my desires? Does he reign over my relationships? Is he sovereign over my ethics? Is he the crowned head of my family? and see if I’m surrounded by sheep – or by goats. those signs by which I might know that I’m in with the sheep. caring for the sick and for those who are in prison. but in a private conversation with his disciples, his closest followers. – and this morning to us, his followers today. With regard to this scripture and today’s politics, two things are sure. into our laps, our checkbooks, our choices, our politics. and not turned away – by you and me. wherever, however they come into our lives. right at our church doors this weekend. and in many cases to newcomers, strangers in our land. on Christmas Eve and Christmas Day. and I know that many of us are being generous in other venues, too. in the neediest and most marginalized of all God’s people. 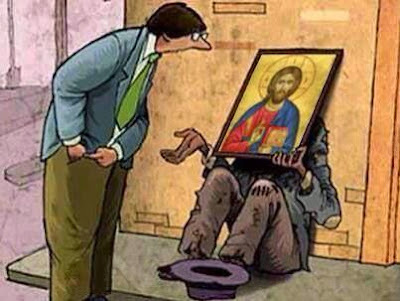 who so often have so much more than we need. serving us with his Body and Blood in the Eucharist. in the lives of the stranger, the poor, the sick and the imprisoned.